As a rule, most home users use the routers based on the “set up and forget” principle. Their main purpose is to share the Internet for the home network, but in some cases, there is a need for something more exotic, for example, you may require the file server or VPN for all your home devices at the same time. In the default firmware, there may not be such features. But, since the software of the majority of modern routers for home use (apart, perhaps, from Huawei, which designed their own operating system) is based on the Linux kernel, and some companies once even discovered a part of the sources, it is possible that there is a custom firmware for your router as well. One of the best and the most popular alternative firmware is DD-WRT. In this guide, we are going to review how to install it on your router. 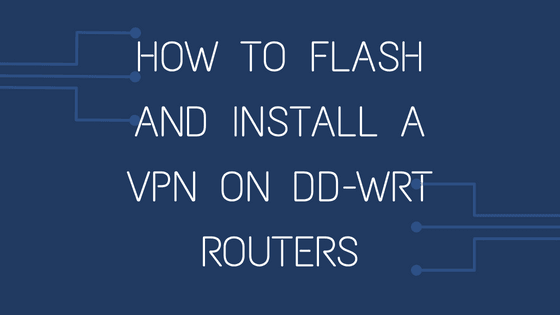 Also, we will provide a step-by-step guide on how to install the VPN on the DD-WRT router. First, it should be noted that the DD-WRT firmware is an operating system based on the Linux kernel. Even with the default settings, it has a very wide functionality, much wider than the default firmware. There are a lot of embedded components such as FTP server, Samba, WOL and much more. Through the web interface, you can get detailed statistics and the channel load in the local, wireless network and the Internet. In addition, you can see the processor load and the available memory of the router. If you configure the router to install additional packages, you can turn your router into a home media server: connected hard drive with an installed torrent client, IPTV broadcast over HTTP protocol for viewing via Wi-Fi. If you have a TV with DLNA support, you can connect the TV to the router and view IPTV, as well as watch movies from your hard drive. However, the more significant benefit is the ability to set up and configure the VPN service. There are a lot of VPN providers who offer the configuration for DD-WRT routers. In most cases, the default firmware does not allow the correct functionality of the service, but it is much better with DD-WRT. Now, let’s try to install this alternative firmware for the router. We are using the TP-Link WR740N router as example. Even if you use a different router, the procedure is very similar. The only possible difference is the alternative web interface menu. First of all, you have to download the firmware file from the official DD-WRT website. Open the homepage, then choose Router Database section, and type your router model. Three symbols are enough. As you install the firmware for the first time, you will need the factory-to-ddwrt.bin file. Download and save it to the hard drive of your computer or mobile device. Reset the router settings by pressing the Reset button for several seconds. This button is usually located on the back of the router. Also, connect the router to a reliable power supply and disconnect the internet cable and other cables, if any. It will save you from unnecessary issues during the blackout and the second will exclude possible conflicts of IP addresses that can make your router unavailable over the network. Connect the router to the computer via the LAN cable. Open the Internet browser, and go to the web interface at http://192.168.0.1 or http://192.168.1.1, depending on your router. The default login and password is admin. To learn more, read the tutorial for your device. Go to System Tools — Firmware Upgrade. Again, this may differ, based on the router vendor. Then click on the File field, click the Browse button and select the factory-to-ddwrt.bin file. We check that we have specified the required file. If it’s all right, flash it by clicking “Upgrade”. The entire upgrade process will be displayed in the window. But do not rush, and in any case, do not touch the power of the router for 5 minutes. In most cases, the router will be flashed in 2 or 3 minutes. In the end, you will see the following window. 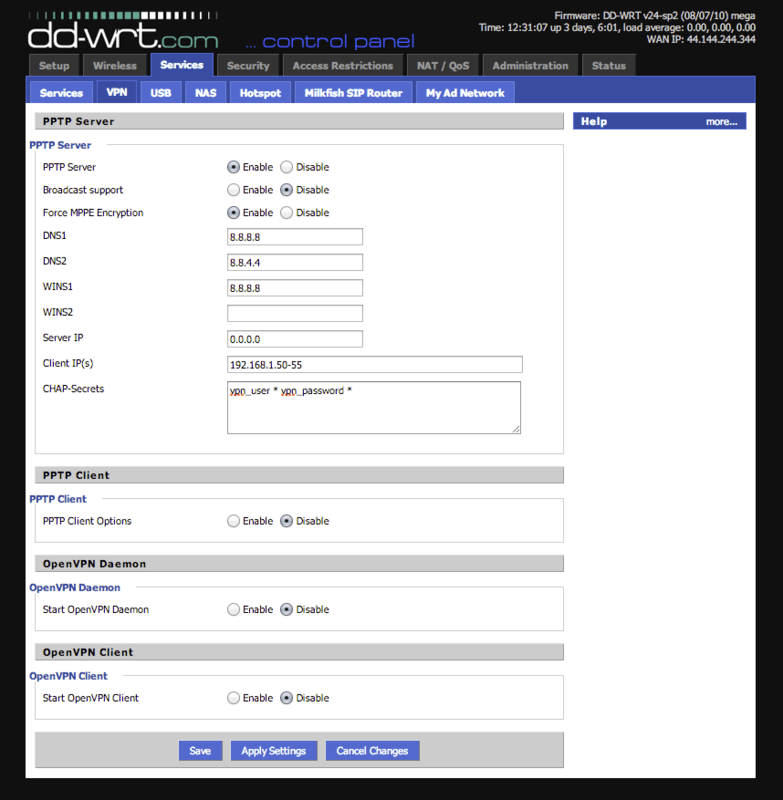 After the update is completed, open the DD-WRT web interface at http://192.168.1.1 where you will see the following page. If it does not work, reboot the router by disabling/enabling its power. The router warns that the device is not password protected, and asks us to fill in the appropriate fields. Fill them in, entering username, password, and password confirmation. Press “Change Password” to save it. That’s all, we can see the main face of the DD-WRT interface and we are ready for the subsequent configuration and use of the router. It is very easy to configure a VPN on DD-WRT. By default, most VPN providers offer the PPTP protocol. Let’s see how to setup and configure it. First, you need to go to Services — VPN in the web-interface of the router. The box in front of PPTP Server must be in Enable mode. 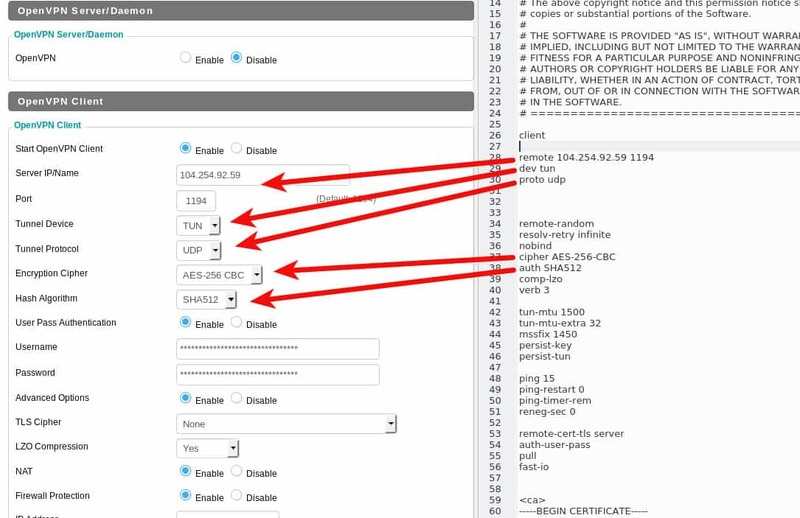 Leave the DNS1 and DNS2 fields empty, if your Internet service provides a dynamic DNS address. You may also list the Google DNS servers: 8.8.8.8 and 8.8.4.4. If your internet provider gives you a specific DNS address, enter it in the field. WINS1 will be equal to DNS1. WINS2 can be left blank. Server IP is 0.0.0.0, although, you may specify the address given by your internet provider. Contact its customer support to learn more details. Client IP is the range of IP addresses that are assigned to VPN clients. CHAP-Secrets is the login and password for connecting to the VPN server. It is written like this: vpn_user*vpn_password*. Apply the changes and establish a connection. Go to the control panel of the router (usually the address is 192.168.1.1). Go to the Services — VPN tab. There should not be a significant difference in setting up a connection to different VPN providers. Activate the OpenVPN client configuration. Most VPN providers that use OpenVPN provide a configuration file for the connection. Of course, the contents of the OpenVPN client configuration files may differ, for example, the encryption mode, the use of data compression, authorization etc., but the principle remains the same everywhere. 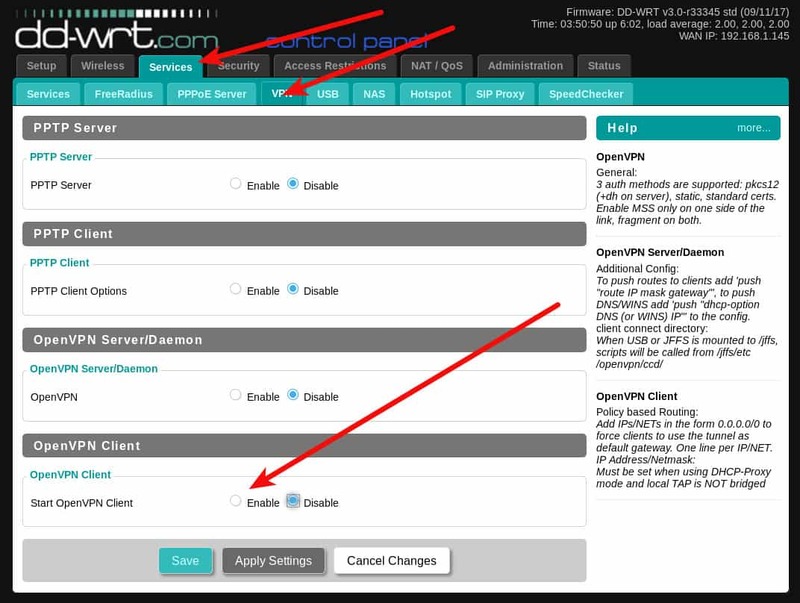 Here is an example of the OpenVPN settings file, and the respective fields on the DD-WRT router can be seen in the screenshot. You must additionally enter the username and password in the appropriate fields. The remaining settings must be copied and pasted into the Additional Config field of the DD-WRT router. Save the settings by clicking the Save button. Now all your traffic passes through the VPN connection and will be encrypted. Some VPN services also provide their own DNS. You can configure the router and use any DNS servers. Change the settings in Setup — Basic Setup. To run the VPN, go back to the Services — VPN tab and click the Apply Settings button. On the Status — OpenVPN tab, the Client: CONNECTED SUCCESS message should appear. Note that the OpenVPN status tab does not appear until the OpenVPN service is enabled. As you can see it is not difficult to set up the DD-WRT firmware on almost any router. Also, it is not a lot difficult to use a VPN service on such a router. Even if you have any troubles, contact the VPN provider customer support to ask for specific help.